California has many different types of wetlands. Coastal marshes are the typical wetlands that most people are know exist. In the SF Bay Area, there are freshwater, brackish, and salt marshes. There are also some bogs in Northern California and one is known for supporting a thriving colony of California pitcher plants. 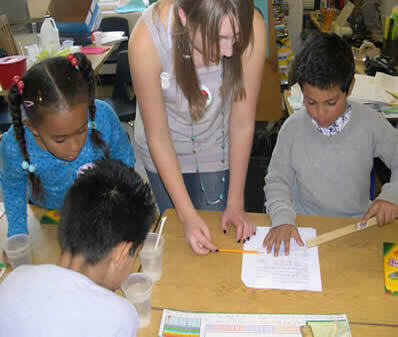 Duckweed is a free floating plant and students make direct observations on plant viability. The plant fronds which look like leaves are actually the stems. The plant obtains its nutrients directly from the water it is floating on, so dosing the samples with water soluble chemicals is simple. To mimic an actual bioassay where a number of different concentrations are tested on a population of plants separately, the experiment involved an explicit number of duckweed fronds which were subjected to added soap. In each classroom, the soap dosed fronds were compared to a control without any added soap. All cups had a certain starting volume of nutrient solution plus either more water for the control or added soap. 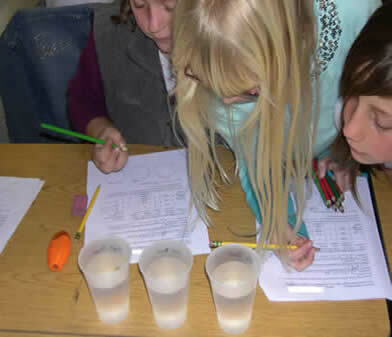 After setting up the lab experiment, the 3rd graders made observations over two days to determine if the soap helped or hindered the duckweed. 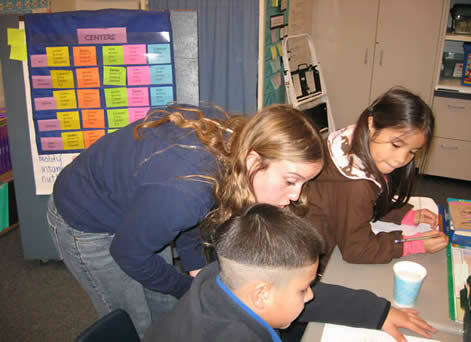 Third grade students also reported their observations and College students listened and sometimes offered input. (photo by CILSA staff).